While I love living in Munich, I firmly believe that the best of Bavaria lies in the Alps. Zugspitze: Visit Germany’s Highest Peak. It would take you two days to climb the highest mountain in Germany, but you can still reach the 2962 metre peak by cable car. Enjoy a beer at Germany’s highest beer garden. This tour includes pickup from your hotel in Munich. Partnachklamm – Visit one of the most beautiful gorges in all of Germany. On this day trip from Munich, you’ll walk alongside a raging river and majestical waterfalls. It’s one of my favourite hikes in the entire Alps. The dramatic scenery far surpasses the effort. You’ll eat lunch at a mountain hut. Something every traveller to Bavaria should do to experience traditional Bavarian style hospitality. Eagle’s Nest – Visit Hitler’s Mountain Retreat. This tour offers something for both history buffs and nature lovers. You’ll leave from Munich and travel on one of the most scenic roads in the German Alps to Berchtesgaden. Onee of only two national parks in Bavaria. The panoramic alpine vistas are among the most dramatic in the country. I’m a huge fan of Berchtesgaden! Take a helicopter ride for the ultimate bird’s eye view of the Bavarian Alps. You’ll see Neuschwanstein, Germany’s most famous castle from a perspective few people ever do. AND you’ll get a close-up view of the Zugspitze, the highest mountain in the country. That’s not to mention all the lakes you’ll fly over. A helicopter ride is truly a unique way to experience the Alps! Below, you will find a few of my favourite hikes in the German Alps. Keep checking back as I have over 50 walks that I still need to add this ever-growing list. What can I say, I hike faster than I write :). I also don’t write about every hike. If it’s just so-so, I don’t write about it. My very favourite hike is the Höllentalklamm (Hell Valley Gorge) in Garmisch-Partenkirchen! Take a look at the photos, and you’ll see why! I also love the Partnachklamm, especially in winter. The huge icicles add to the drama! The Partnachklamm can be easy if you just decide to hike to the gorge and back. You can make it slightly more challenging if you hike to the nearest hut. Alternatively, you can choose one of the much longer extensions! You can also reach King Ludwig’s Mountain Hut by passing the Partnachklamm. This destination is also available as a tour from Munich. For views, you can’t beat the Herzogstand to Heimgarten. It’s a fantastic ridge walk offering great views of the Walchensee. It was a favourite among Bavarian royalty! Warning, this hike is not for you if you’re afraid of heights. Fortunately, it can be modified. You can still hike up to the Herzogstand, and skip the ridge walk to the Heimgarten. Brauneck Mountain, where hikers and skiers meet! If you’re a hiker seeing solace, not skiers, as I am, the Brauneck, located near Lenggies, should not be your first choice for a hike. But the views from the top do help compensate for the trail. Hut hiking in Germany is not exactly a luxurious experience. It can even be stinky, but I still enjoy it. Find out what it’s really like to sleep in a mountain hut. 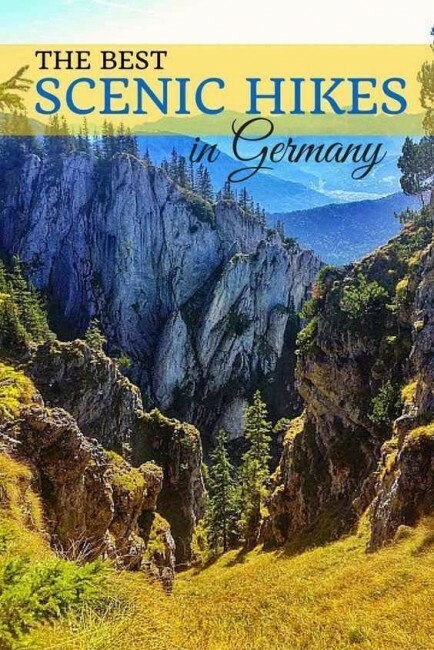 Here are 3 of my favorite hikes in Bavaria, named so because of the scenery, views, or just really fun hiking/scrambling terrain. I love winter hiking and the incredible snow-capped mountain views that come with it! There’s a winter hike suitable for everyone and your toned legs will thank you! toned legs will thank you – once they stop burning! Partnachklamm (Gorge) in Garmisch-Partenkirchen, Bavaria, Germany is simply breathtaking in winter with its huge dripping icicles and frozen waterfalls. The Jochberg is a popular day hike in the German Alps with views of both the Walchensee and the Kochelsee. You should go! Hell Valley Gorge, (Höllentalklamm) is the best hike I’ve done in Bavaria, Germany. Located in Garmisch-Partenkirchen it’s also easily accessed from Munich. The Herzogstand isn’t just an ordinary mountain summit, but one that was favored by royalty and offers stunning views of the Walchensee.